Is Phuket safe? That’s a question many ask when considering travel to Thailand’s largest island thanks to the occasional incident hitting international headlines. As a Phuket resident of more than a decade I’ve rarely felt unsafe and most travellers to Phuket come and go without any problems, but unfortunately a percentage of those visiting the island will find themselves in a harmful situation. Red-flagged. A little beacon of doom on Karon beach. Though there’s little need to be paranoid, being alert and aware of some of the dangers can help you avoid falling victim to a crime or an accident on Phuket. Here’s what we’d recommend you do to stay safe. 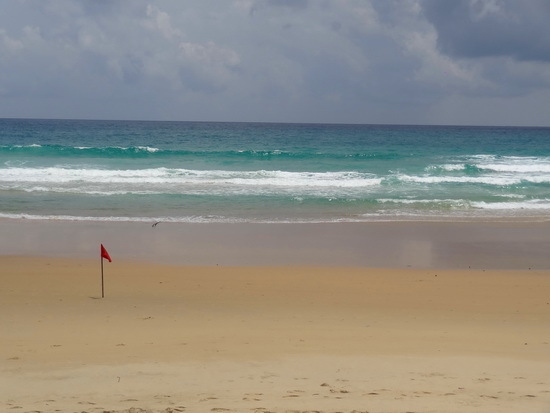 Phuket’s main beaches are now staffed with lifeguards, but a number of drownings still occur each year here, especially during the southwest monsoon months of May through October. When the beaches are lined with red flags warning of strong waves and undertow, stay out of the sea. If in doubt, stay out even at smaller beaches with no flags. Phuket has one of the highest rates of traffic accidents in Thailand. It can be dicey driving here at the best of times, and especially so if you’re unfamiliar with the roads and the local (crazy) way of driving. Rent a motorbike only if you’re experienced and always wear a helmet. Make sure you have adequate insurance coverage in case of an accident, since hospital care can quickly add up for treatment of serious injuries. Some boats are safer than others. 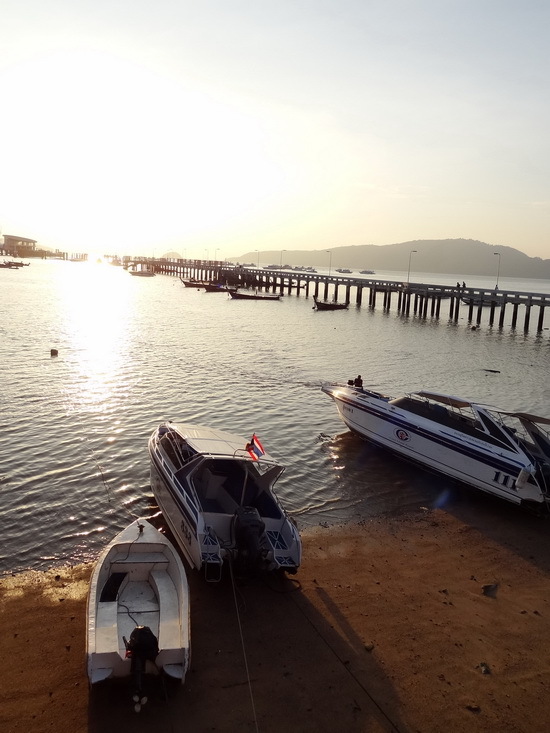 Boating accidents happen more often than they should in Phuket due to rather loose controls in the marine sector. Before setting off on a boat trip, make sure it’s stocked with lifejackets for everyone and don’t always trust the tour company for solid advice on whether it’s safe to travel or not if weather conditions look unfavourable. If booking a super cheap speedboat trip, you can be sure shortcuts have been taken in crew training and equipment. We’ve heard from hospital staff that they regularly treat neck and back injuries caused by boats driven at reckless speeds. 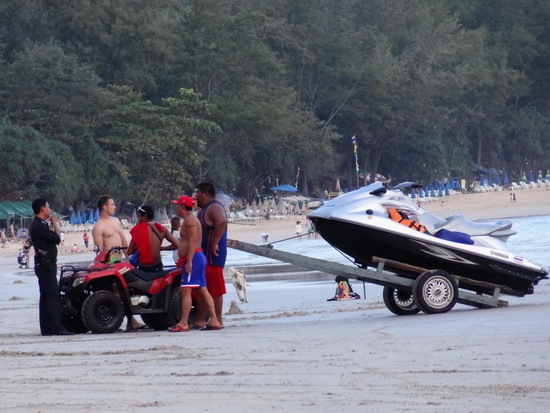 With no controls on speedboats and jetskis at Phuket’s beaches, swimmers may find themselves uncomfortably close to motorised vessels. Some beachfront hotels have taken it upon themselves to cordon off some areas with ropes and buoys so you might try swimming in these safer areas to avoid a collision. Keep your cool with the jetski boys. Better yet, just avoid them. Electrical systems are not always properly grounded and Phuket’s power lines are often a tangle of wires, so electric shock can be a worry here. A few fatal electric shock incidents have occurred in the wet season when unwary pedestrians step in puddles electrified by a dangling wire or come into contact with an exposed outlet; yes, the chances of this happening are slim, but these have happened. A few robbers rove Phuket’s roads looking for easy pickings of iPhones and cash, most often by snatching bags off pedestrians as they speed by on their motorbikes. If walking or on a motorbike, try to keep your bag out of sight, and secure your passports and valuables in a hidden pouch or your hotel safe. If an attempt is made on your bag, Phuket police recommend letting it go rather than hanging on and risking an escalation of violence. If you’re in Patong beach especially, be watchful for pickpockets, particularly any especially friendly katoey (ladyboys). Violent assaults against travellers usually happen late at night, so if you’re out on the town try to keep your wits about you. There have been cases of women travelling alone being sexually assaulted by tuk tuk or taxi drivers. Keep a close eye on your drink at the bar as there have been reports of robberies linked to drink spiking. Violence has erupted over disputes on taxi fares or other services. Though it may seem unfair, you might want to consider just letting it go, paying up and take it a lesson learned. Losing some money is always preferable to getting a beatdown. In the case of a jetski rental dispute, well, just don’t ever rent a jetski because those battles rarely end well. 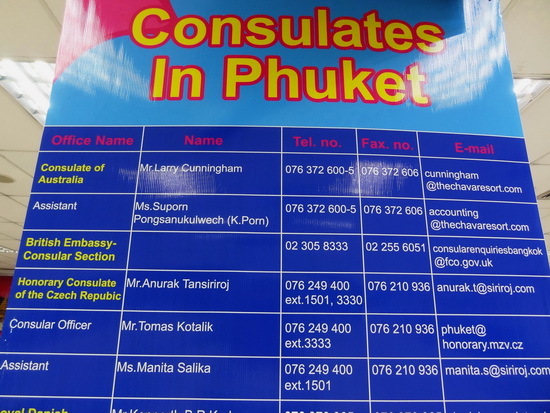 A list of consulates in Phuket seen at the airport baggage claim area. As with everywhere in Thailand, be aware that recreational drugs are illegal and the penalties for having or selling them can be severe. As well, getting involved with illegal drugs may expose you to criminal elements who are unlikely to have your health and safety as a top priority. If you find yourself in trouble that’s too serious to sort out on your own, call the Tourist Police at 1155 or your consulate for help. Several nations have honorary consuls in Phuket, while some travellers will need to contact their embassy in Bangkok for assistance. Though even the savviest travellers could fall victim to crime and accidents, avoiding trouble often comes down to simply employing some common sense. Generally speaking, if it’s a stupid or risky thing to do in your own country, it’s doubly so in Phuket when you’re in unfamiliar territory with a different set of laws and ways to resolve things.